The new Bo Bunny Sweet Life I Want It All Bundle from FotoBella is so beautiful, full of butterflies and blossoms, and touches of glitter! I love how it looks with this old photo of my dad with some of his siblings! 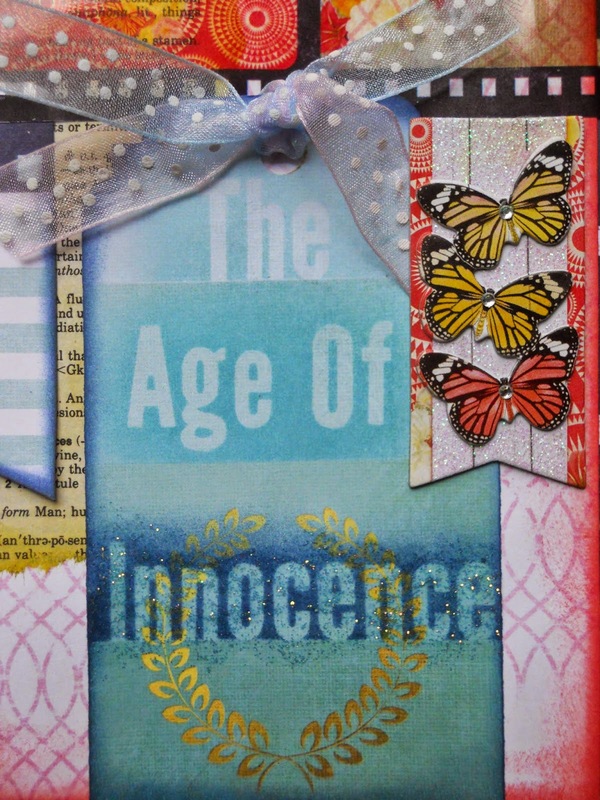 I started this page by masking the top right corner with some gesso and the new Tim Holtz Lace Stencil. For some sparkle, I added some glitter to the gesso as soon as I lifted my stencil. Make sure to wash your stencil right away too! 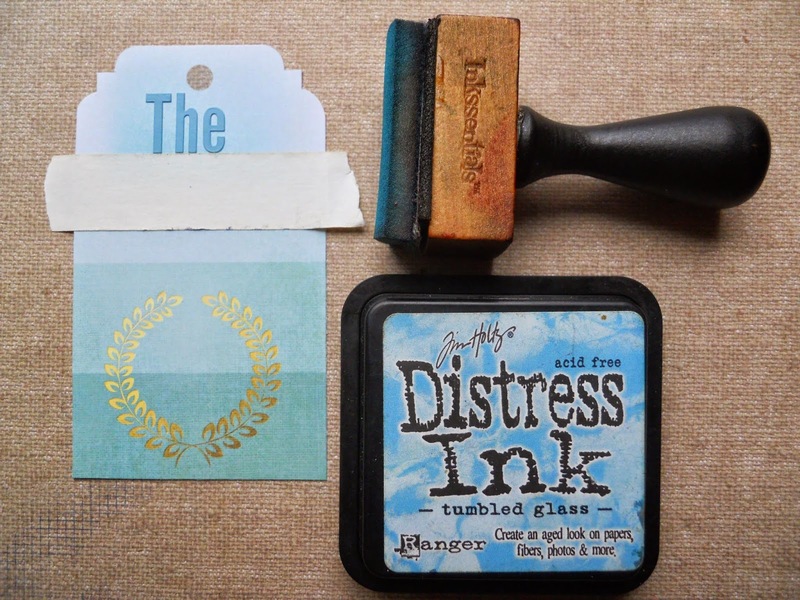 The new Distress Ink (Abandoned Coral), which I used on some of my paper edges, really helps soften this page and give it a more vintage look. From the Ephemera, I used the book page, tearing and inking the edges with Distress Ink (Mustard Seed), the cream paper on the top left, and the ribbons on the title tag. I fussy-cut some of the flowers, and stamped some with the new Bo Bunny Floral stamp, adding Stickles to them for extra shine. Then I added a few of the new pink Petaloo Burlap Mini Flowers. For some more depth, I cut part of the large butterfly wing and curled it up, right under my floral cluster. Two of the tags were cut from paper, and I layered the smaller one underneath the Film Sticker. 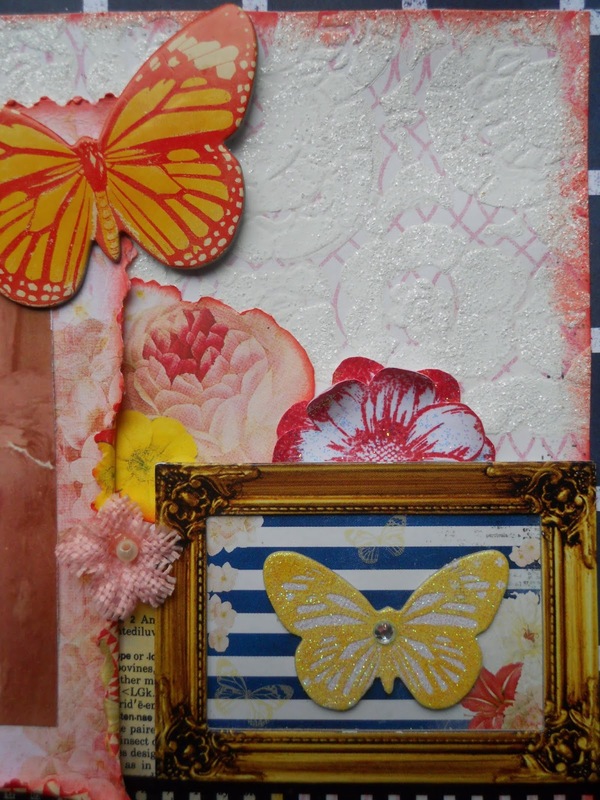 To pick up the gold in the framed Layered Chipboard butterfly, I added a sparkly gold brad. The banner with the 3 butterflies on it, also comes in the layered chipboard, and the other butterflies are from the Chipboard. To make the title tag, I simply masked it using the alpha stickers that come in the 12 x 12 Collection Pack. Before placing the stickers on your tag though, make sure to stick them onto your carpet or clothes first, so you don't have any problems when you lift your letters off. I used some artist's tape across the bottom of the first stripe, and masked "The" with Distress Ink (Tumbled Glass). Then I placed the tape along the top and bottom of the next stripe, and masked "Age Of" with Distress Ink (Broken China). 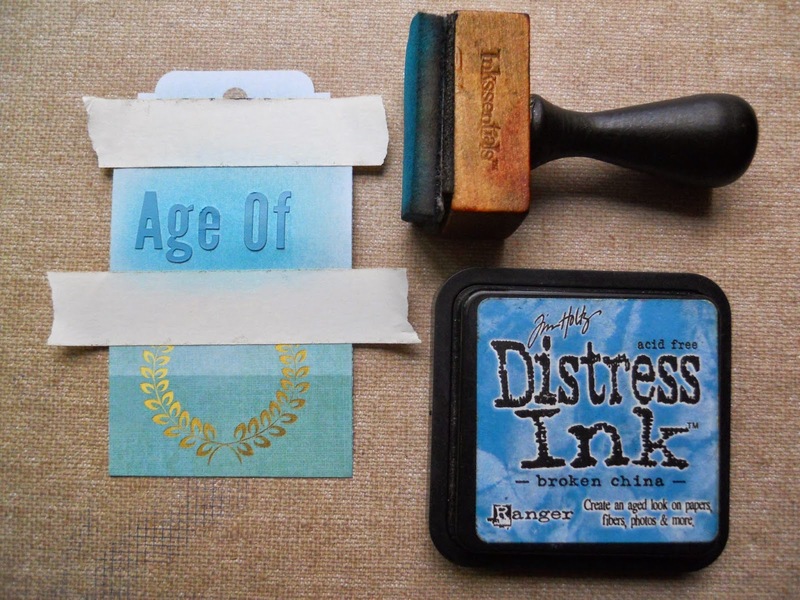 To mask "Innocence" I used Distress Ink (Chipped Sapphire), and inked the rest of the tag with it. 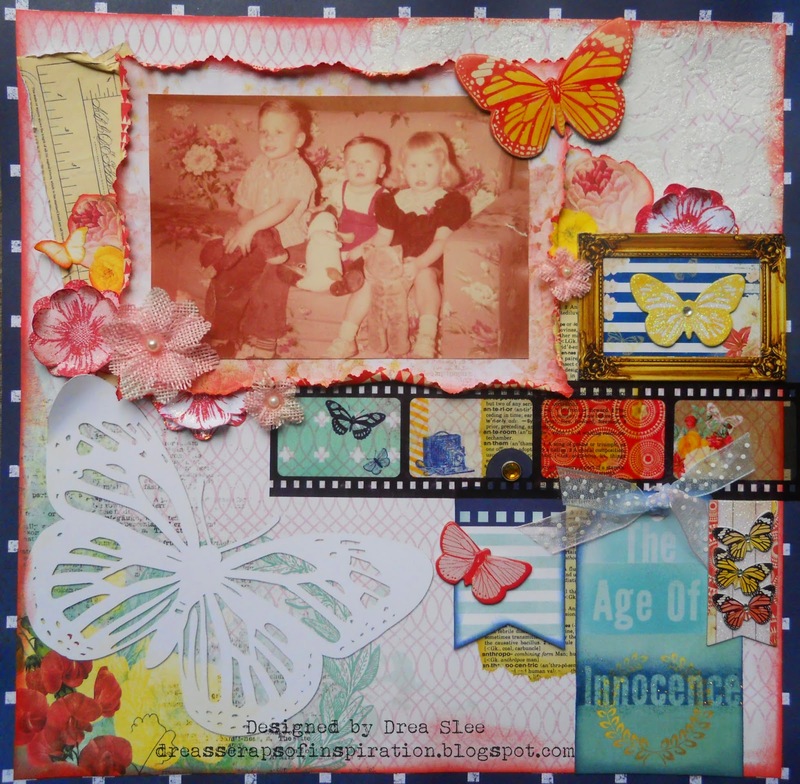 I highlighted "Innocence" with some Stickles, and finished it off with the sheer ribbons from the Ephemera.